This is one of the greatest quotes on what it takes to succeed in life, by the greatest basketball player of all time, Michael Jordan. The first image that comes to mind when people think of Michael Jordan is the embodiment and definition of being a champion, which is perfectly captured by the game 6 game-winning and championship-winning shot in the 1998 NBA World Championships which he captured for the Chicago Bulls against the Utah Jazz. This went down as one of the greatest and most clutch shot in NBA History, as well as being the final shot taken by Michael Jordan as a member of the Chicago Bulls. With all of Michael Jordan's success, both on the basketball court as well as in the corporate world, we should not overlook what made Michael Jordan this successful. What made Jordan this successful was not solely natural born talent, which many NBA players also have, or simply luck, as he was not born wealthy, but rather a relentless pursuit of excellence. This pursuit was also tempered with an understanding that in order to ultimately succeed in life there will be many, many times where you will fail. 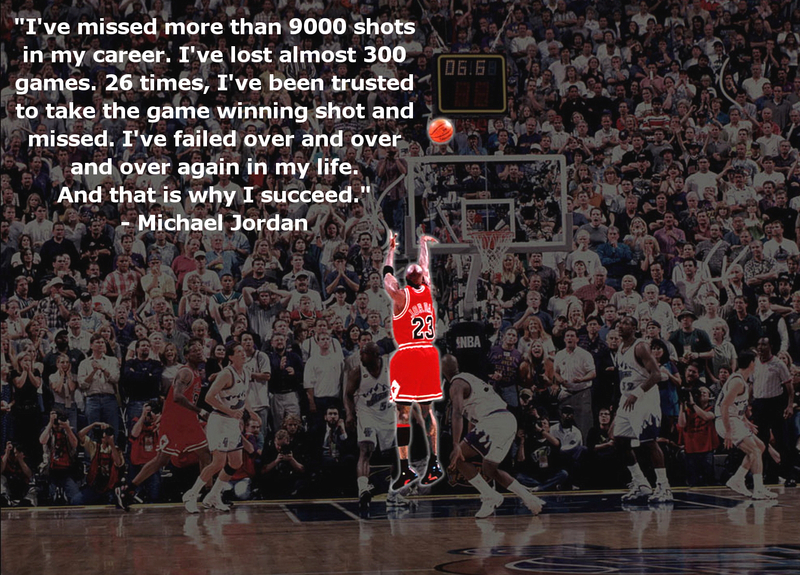 But Jordan knew this very well, but also knew that the ultimate and real failure is to not try, or worse give up. So in everything in life, be as Jordan was and pursue excellence and never get shaken when you fail.